From Sydney, make your way to the entrance of the Newcastle M1 motorway. Travel north for 117kms along the M1 until just past the B89 turnoff, take the exit on the left to Newcastle marked M15 Hunter Expressway and Newcastle Link Road. On the exit ramp veer left to merge onto the M15 Hunter Expressway. Continue on the M15 for 38kms to where it finishes and becomes the A15 New England Highway, then a further 9.5kms along the A15 turn left where there will be signs indicating the B84 Golden Highway (to Merriwa, Dubbo). Turn left onto the Golden Highway and follow this through to a T intersection (Putty Road from Singleton). At the T intersection turn left and travel approximately 4km (double lanes) where you will see an overhead pass (Mt Thorley). Immediately after the overhead pass turn right (Denman, Jerrys Plains) (B84 Golden Highway). Follow this for approximately 10km to the very small town of Warkworth. Warkworth is so small that the only noticeable landmark is the 80kmh zone. Less than 1km after the end of the 80kmh zone, turn right onto Comleroi Rd (signed Gliding Club), our club entrance is approximately 1km on the left. From Newcastle, make your way along Kings Street through to Parry Street and onto the junction with Newcastle Road travelling west where the A15 has signs pointing to Wallsend, Sydney. 1.4kms on the A15 veers left along Thomas Street. Continue on through a roundabout where the road merges into the Newcastle Link Road heading towards Maitland, Sydney. Continue on the Newcastle Link Road through another roundabout and on to where the A15 merges to become the M15 Hunter Expressway at the junction with the M1 motorway. At the T intersection turn left and travel approximately 4km (double lanes) where you will see an overhead pass at Mt Thorley. Immediately after the overhead pass turn right (Denman, Jerrys Plains) (B84 Golden Highway). Follow this for approximately 10km to the very small town of Warkworth. Warkworth is so small that the only noticeable landmark is the 80kmh zone. Less than 1km after the end of the 80kmh zone, turn right onto Comleroi Rd (signed Gliding Club), our club entrance is approximately 1km on the left. From Cessnock, drive through the vineyards to Broke. At the Broke T-intersection, turn right, towards Singleton. Turn left at Charlton Road, just out of Broke. This takes you to a T-intersection with the Putty Road. Turn right, then immediately left onto Wallaby Scrub Road. When you reach the Golden Highway T-intersection, turn left, towards Jerrys Plains. Less than 1km after the end of the Warkworth 80kmh zone, turn right onto Comleroi Rd (signed Gliding Club), our club entrance is approximately 1km on the left. From Singleton, drive south along John Street or via the town bypass towards Mount Thorley and Windsor. (Putty Road.) When you get to the Mount Thorley area, you will see an overhead pass. Immediately after the overhead pass turn right (Denman, Jerrys Plains) (B84 Golden Highway). Follow this for approximately 10km to the very small town of Warkworth. Warkworth is so small that the only noticeable landmark is the 80kmh zone. Less than 1km after the end of the 80kmh zone, turn right onto Comleroi Rd (signed Gliding Club), our club entrance is approximately 1km on the left. From Muswellbrook or Scone, you may choose to go via Singleton, Lemington Road or Jerrys Plains. The route through Jerrys Plains is shorter but also easier to get lost. If driving via Singleton, drive south along John Street or via the town bypass towards Mount Thorley and Windsor. (Putty Road.) When you get to the Mount Thorley area, you will see an overhead pass. Immediately after the overhead pass turn right (Denman, Jerrys Plains) (B84 Golden Highway). Follow this for approximately 10km to the very small town of Warkworth. Warkworth is so small that the only noticeable landmark is the 80kmh zone. Less than 1km after the end of the 80kmh zone, turn right onto Comleroi Rd (signed Gliding Club), our club entrance is approximately 1km on the left. From Taree or the North Coast, take the A1 Pacific Highway south to the New England Highway junction just after crossing the Hunter River. Turn right onto the A1 New England Highway heading towards Sydney. 4.3kms on veer to the left off the New England Highway onto John Renshaw Drive towards the M1 motorway entrance. 1.4kms on at the M1 motorway roundabout entrance continue straight ahead on B68 John Renshaw Drive heading towards Kurri Kurri. Travel 10kms along John Renshaw Drive through to the roundabout at the junction with the M15 Hunter Expressway. Take the third exit on the left and merge onto the M15. Continue on the M15 where it finishes and becomes the A15 New England Highway, then a further 9.5kms along the A15 turn left where there will be signs indicating the B84 Golden Highway (to Merriwa, Dubbo). Turn left onto the Golden Highway and follow this through to a T intersection (Putty Road from Singleton). Ultralights, GA and anything else that flies will be welcomed at Warkworth. All our gliders listen to 126.7MHz around the airfield. Announce your arrival approximately 10 miles out to "Traffic Warkworth". The gliders probably won't reply to you unless a conflict appears imminent but they will be listening. There is no preferred circuit direction - the gliders will use both circuits at the same time. 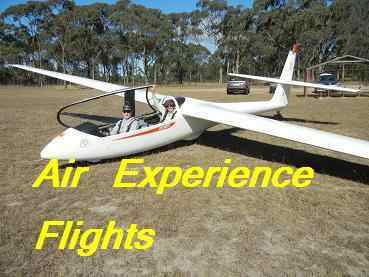 If unsure whether gliders are operating you should over fly to check. If no operations are apparent a precautionary circuit is recommended to check for kangaroos on the runway. Be aware however that a glider in circuit is very likely to be in the same area as your precautionary circuit. No approval is required for recreational operations including navigation training flights by student and private pilots. Emergency operations by organisations such as RFS etc. also do not require approval. Commercial operations require prior approval and are subject to a landing fee of $10 per engine. This should be paid to the club by bank transfer to Westpac BSB: 032-167 Account: 344776. Specify "Landing fee date & registration".